Symptomatic relief of cold & flu. Extract of fresh Echinacea purpurea. 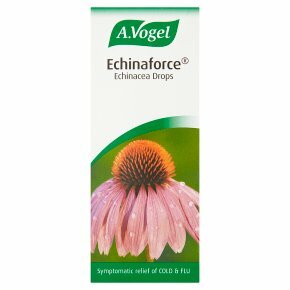 Echinaforce is a traditional herbal remedy used to relieve the symptoms of: Cold Flu Upper respiratory tract infections Echinaforce helps maintain the body's resistance by supporting the immune system. Directions for use: Adults, elderly and children over 12 years: Take 15 drops (0.6 ml) in a little water two to three times daily. Start taking this product at the first signs of a cold. Not for use in children under 12.<br>For oral use only. Read leaflet before use.<br>Do not use if you are allergic to Echinacea, other members of the daisy (Asteraceae/Compositae) family or any of the other ingredients or if you are pregnant or breast-feeding.<br>If symptoms worsen or persist after 10 days, consult your doctor.<br>Keep out of the reach and sight of children.<br><br>This product contains ethanol. Harmful for people suffering from alcoholism. See leaflet for further information.